Debyi from Healthy Vegan Kitchen was the host for the September 2009 Daring Cooks challenge. She decided on Indian Dosas from the refresh cookbook by Ruth Tal. 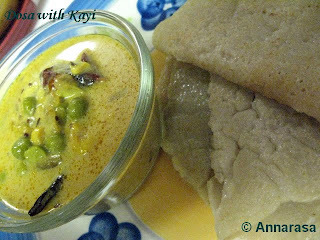 Here is my version of the Dosas made very simply with a batter of rice and tamarind. The curry has potato, beans, peas, and fresh corn in a simple coconut-chili sauce. Doesn't it look just yummmm!!! !